As many of you know, Rackspace acquired the transactional email provider Mailgun almost a year ago. Mailgun has a super easy-to-use API for sending, receiving and tracking on your application emails. They also support SMTP, if that's your thing. We've blogged about Mailgun a bunch this year, and recently Rackspace integrated Mailgun into the Rackspace Cloud Control Panel, making it that much easier to integrate Mailgun into your app (and to get 50,000 free emails per month in the process). The Mailgunners just released a new feature that we are really excited about: email validation for web forms. So today, we're reblogging their post announcing the new feature which is completely free for Rackspace and Mailgun customers. 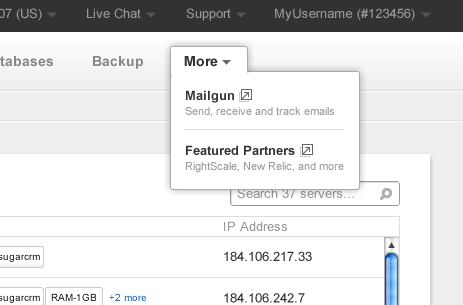 Read on, and remember that you can enable your Mailgun account directly through the Cloud Control Panel! Email validation is a hard problem that every single developer, building anything on the web, has to deal with. We actually have been working on email validation ourselves for years (more on that below). We looked at the validation services available and weren’t satisfied with any of them, either for performance, accuracy, or completeness reasons. So today, we’re releasing our newest API project, which we affectionately called Guardpost, and are also pulling back the curtain to show exactly how we built it. We’re launching this as a free service that anyone collecting email through web forms can (and should!) use. You’ll need a Mailgun account to use the service, but you don’t have to send your emails through Mailgun. If you want to get started right away, check out the API documentation, or a little sample jquery app, as an example of how to use Guardpost in a signup form. We suggest using Guardpost as part of your email collection form to reduce typos and false address submission in conjunction with a link emailed to the address to confirm the email is valid (double opt-in). Of course, you can use Mailgun to send the double opt-in email, as well. We do not intend this to be a bulk mailing list cleaning service, and if we see it used as such, we reserve the right to disable your account. To call the Guardpost API, just use the publishable API key in the My Account tab of your Mailgun account (the one with the pub-key prefix). Why is email validation so hard? Email address syntax is fairly complex, complex enough that it is difficult to express with a regular expression, while being readable and maintainable for developers. There is no single definition for valid syntax for an email address. The definitions that do exist frequently conflict. The Internet runs on the Robustness principle, so mail servers accept addresses that do not conform standards but are otherwise understandable. Why did we create an email validation API? Our goal is not to make a perfect address validator to validate every single address that has ever been created. Our goal is to build a realistic address validator for the types of addresses that we see everyday. We’ve sent billions of emails and collected a lot of ESP data. We know that gmail.com is a valid MX host while gmali.com is not. Furthermore, the validator is Email Service Provider (ESP) specific. This means we can go way beyond valid syntax checks and bring in specific requirements for Gmail vs. Yahoo vs. Hotmail. What does the Validation service do? Email address syntax is fairly complex, enough to make a pure regular-expression-based approach cumbersome and unmaintainable. Check out RFC 2822 and RFC 5322, which discuss proper email format, and then see this discussion on Stackoverflow, if you need some convincing. That's why we wrote a parser that analyzes addresses and determines whether they are valid based on a formal grammar. What is a formal grammar? Formal grammars (and specifically, in our case, a context-free grammar) are a set of rules that define the structure of a string. For example, it allows us to transform something we intuitively understand, such as an address list, into something formal that a computer can parse. We built our parser around the preceding grammar for what we think is a realistic email address syntax. Again, this is not just based on RFC, but what we see ESPs accepting from sending billions of emails. Just because an email address is syntactically valid, doesn’t mean that anyone receives mail at that address. To receive mail, you have to have a server that listens for incoming messages, this server is called a Mail Exchanger (MX) and is usually defined in your DNS records. That’s why, in addition to syntax checks, we look up the domains DNS records to see if a MX server has been defined to accept mail. Again, due to the robustness principle, just because a host does not define MX records does not mean they can’t accept mail. Mail servers will often fall-back to A records to try and deliver mail. That’s why we go one step further than just a DNS query, we ping the Mail Exchanger to make sure that it actually exists. Being liberal in what you accept is just one part of the robustness principle, and the second is be conservative in what you send. Because of that, most ESPs actually have a fairly stringent rules for the local-part (before the @ symbol) you can actually create. For example, Yahoo Mail addresses can only contain letters, numbers, underscores, and one period. So while an address like, “John Smith”@yahoo.com is completely syntactically valid, it does not actually exist at Yahoo Mail and will bounce. That’s why if we know the Mail Exchanger the mail is going to, and we know the big ones like Yahoo, Google, Microsoft (including Hotmail), AOL, and Apple we validate against their more stringent rules. Email addresses are frequently mistyped. Instead of @yahoo.com, you might type @yaho.com, that’s why, as part of our validation service, if we detect a misspelled word, we offer suggestions so you don’t miss mail due to a typo. Here’s what that looks like in the jquery demo app [source] we mentioned above. We don’t check if a mailbox actually exists on a server. This used to be a feature of SMTP, but due to abuse by spammers, this was disabled by most major ESPs. We are not a mailing list cleanup service. This service is meant to be used to increase sign-up accuracy, not to cleanup mailing lists purchased from questionable sources. We will be monitoring usage and reserve the right to shut down anyone that is using it inappropriately. So that’s it. We hope you enjoy the service and it makes your life easier. If you have any questions or comments, let us know.